CNN — Getting enough rest should be as simple as just shutting your eyes. 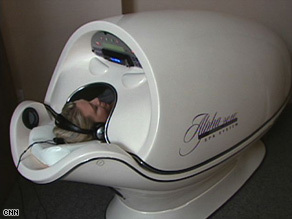 The alpha pod, designed for napping, includes a heated, vibrating bed and a CD player. But according to a recent study done by the National Institute of Neurological Disorders and Stroke, a branch of the National Institutes of Health, it’s really not that easy. Their research has found that 40 million Americans suffer yearly from chronic sleep disorders, and an additional 20 million complain of occasional sleeping problems. For some of us, it just means dark circles under our eyes and a desperate need for triple-caffeinated products. But the reality is that over the long haul, trouble with sleep can cause bigger problems. “There are studies out there which would suggest that people who sleep less over long periods of time are at much higher risks of car accidents, and also some medical disorders like high blood pressure, potentially heart or stroke disease,” said Dr. David Schulman, director of the Emory Sleep Clinic Laboratory in Atlanta, Georgia. And that means fewer than the seven to eight hours most people need daily to get the proper amount of rest. So what is the solution to all this restlessness? For some people, the answer might be to just buy some. Yes, sleep has now joined the ranks of those products we at one time thought we would never have to pay for, like water. Years ago, the thought of paying money for a bottle of something you could get for free from the tap would have had people laughing. Now we can add sleep, or, more accurately, napping. Spas across the country have now added this new nap therapy to their offerings, so along with facials, waxing and massages, you can now grab some Z’s for about a dollar a minute. “We have two types of nap pods,” she says. “They are called the energy pod and the alpha pod. The alpha pod has more of a spa-experience feel to it.” The pods release aromas and have a heated, vibrating bed, a CD player and headphones. “Everything outside just goes away,” she says. This napping therapy, while not taking the country by storm, has found some happy clients willing to pay for sleep. For Autumn Watson, whose full-time job becomes more challenging after a night where her young son doesn’t sleep, a nap is worth every penny. And for Tremaine Perry, who works close to the spa, it took a bit of time to embrace this latest trend. “Initially, I was skeptical. You’re paying for something that you can do at home for free, but it wasn’t until I actually tried it and realized the difference” between going through a full day needing rest and coming in, taking a quick break and going back to work. And finally there are other ways to recharge that don’t cost money, including meditation, a walk outside, a hit of caffeine or even just getting up and walking away from your desk. But Schulman says that while all of these are good options, none of them work quite as well as a 20-minute nap. So maybe that dollar-a-minute price for some rest is actually money well spent.